During the 2014 Christmas Cheer Broadcast, Lisa Mierins (right) joins Angie Poirier, Trisha Owens, and Stuntman Stu from the Majic 100 morning show! An Ottawa institution since the early 1950s, the “Christmas Cheer Broadcast” has often been referred to as the official kick-off to the Christmas season in the Ottawa area! Airing on 580 CFRA, the annual “Christmas Cheer Broadcast” raises funds for the Christmas Cheer Foundation in support of a number of organizations such as the Ottawa Food Bank and Caring and Sharing Exchange. With its companion Christmas Cheer Breakfast, the Christmas Cheer Broadcast is the premiere holiday fundraiser allowing the Foundation to give back to those who need it most during the holiday season. 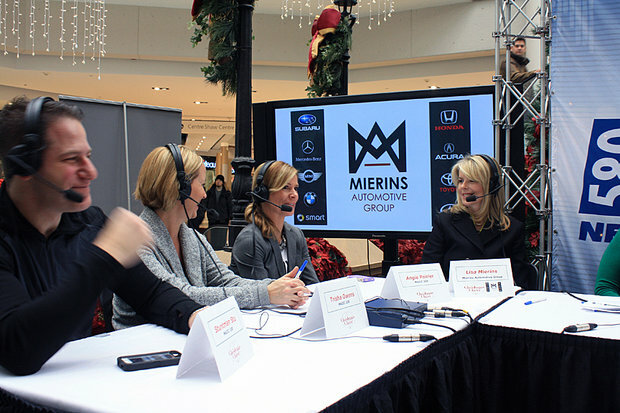 The Mierins Automotive Group is and has been a proud supporter of the initiatives of the Christmas Cheer Foundation. It is our sincerest wish for health and happiness for you and your loved ones during the Christmas holiday season and year ahead. For more information, visit MINI Ottawa.